A rotavirus vaccine protects children from rotaviruses, which are the leading cause of severe diarrhea among infants and young children. Each year an estimated 453,000 children die from diarrhoeal disease caused by rotavirus, most of whom live in developing countries, and another two million are hospitalised. Rotavirus is highly contagious and resistant and, regardless of water quality and available sanitation, nearly every child in the world is at risk of infection. There are two rotavirus vaccines approved by global health agencies: Rotarix by GlaxoSmithKline and RotaTeq by Merck. The development of new vaccines intended to be offered at lower cost than the approved vaccines, is ongoing. Sanofi affiliate Shantha Biotechnics  The development of a vaccine called Rotavac by Bharat Biotech was announced in India in 2013, and has been tested in Phase III trials. On June 5, 2009, the health system. 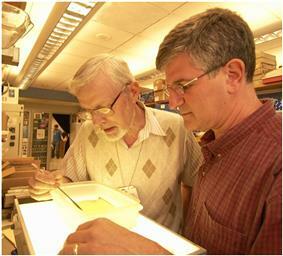 H. Fred Clark and Paul Offit, the inventors of RotaTeq. On March 22, 2010, the detection of DNA from porcine circovirus types 1 and 2 within RotaTeq and Rotarix prompted the FDA to suspend the use of rotavirus vaccines while conducting an investigation the finding of DNA from porcine circovirus-1 (PCV1) in the vaccine in collaboration with the 12 members of the Vaccines and Related Biological Products Advisory Committee (VRBPAC). On May 6, 2010, the FDA announced its decision to revoke the suspension, stating that porcine circovirus types 1 and 2 pose no safety risks in humans and concluded that health risks involved did not offset the benefits of the vaccination. In May 2010 the suspension of the Rotarix vaccine was lifted. An Indian-made rotavirus vaccine, Rotavac, is in development, in phase III trials. If approved by the Drugs Controller General of India, it would be available at Rs. 54 per dose, more affordable than the two vaccines now available costing more than Rs. 1,000 per dose. Other vaccines are undergoing clinical trials. These include: a human neonatal PG3 strain, RV3, developed by Ruth Bishop and colleagues in Australia, a human bovine reassortant vaccine developed by Albert Kapikian and presently undergoing development and trials in different countries and a neonatal strain vaccine (G9P11) being developed by Bharat Biotech in India. This G9P(11) virus strain has the VP4 of bovine rotavirus origin, and all other segments of human rotavirus origin. Other approaches to the development of rotavirus vaccines are also being pursued. Rotavirus antigens for parenteral delivery have received some attention as virus-like particles prepared in baculovirus, expressed antigens, DNA vaccines, and killed virus. These novel approaches are being pursued using animal models. A 2009 review estimated that vaccination against rotavirus would prevent about 45% of deaths due to rotavirus gastroenteritis, or about 228,000 deaths annually worldwide. At $5 per dose the estimated cost per life saved was $3,015, $9,951 and $11,296 in low-, lower-middle-, and upper-middle-income countries, respectively. The cost of rotavirus vaccination has fallen by 67 percent between 2006 and 2011 to USD 2.50 per dose, as part of an offer made by a pharmaceutical company to the GAVI Alliance. However, the vaccine is still more expensive than most other childhood vaccines included in the WHO's Expanded Programme on Immunization. Safety and efficacy trials of Rotarix and RotaTeq in Africa and Asia found that the vaccines dramatically reduced severe disease among infants in developing countries, where a majority of rotavirus-related deaths occur. A 2012 Cochrane review of 41 clinical trials that included 186,263 participants concluded Rotarix and RotaTeq are effective vaccines. Additional rotavirus vaccines are under development. Rotavirus vaccines are licensed in more than 100 countries, but only 31 countries have introduced routine rotavirus vaccination as of 2011. The incidence and severity of rotavirus infections has declined significantly in countries that have acted on the recommendation to introduce the rotavirus vaccine. In Mexico, which in 2006 was among the first countries in the world to introduce rotavirus vaccine, the diarrheal disease death rates from rotavirus dropped by more than 65% among children age two and under during the 2009 rotavirus season . In Nicaragua, which in 2006 became the first developing country to introduce the rotavirus vaccine, investigators recorded a substantial impact, with rotavirus vaccine preventing 60% of cases against severe rotavirus and cutting emergency room visits in half. In the United States, vaccination has reduced rotavirus-related hospitalizations by as much as 86% since 2006. The vaccines may also prevent illness in non-vaccinated children by limiting exposure through the number of circulating infections. In September 2013, the vaccine will be offered to all children in the UK, aged between two and three months, and it is expected to halve the cases of severe infection and reduce the number of children admitted to hospital because of the infection by 70 percent. In 1998, a rotavirus vaccine (RotaShield, by Wyeth) was licensed for use in the United States. Clinical trials in the United States, Finland, and Venezuela had found it to be 80 to 100% effective at preventing severe diarrhea caused by rotavirus A, and researchers had detected no statistically significant serious adverse effects. The manufacturer of the vaccine, however, withdrew it from the market in 1999, after it was discovered that the vaccine may have contributed to an increased risk for intussusception, or bowel obstruction, in one of every 12,000 vaccinated infants. There then followed 8 years delay until rival manufacturers were able to introduce new vaccines which were shown to be more safe and effective in children: Rotarix by GlaxoSmithKline and RotaTeq by Merck. Both are taken orally and contain disabled live virus. The experience, however, provoked debate about the relative risks and benefits of a rotavirus vaccine. This is because rotavirus is responsible for 29% of deaths from diarrhea in children below 5 years worldwide, and thus 4.2 million deaths could be avoided during that 8 years in different parts of the world. Meanwhile, other countries such as Brazil and Mexico undertook their own independent epidemiological studies which demonstrated that 4 deaths were attributable to vaccine, while it had prevented approximately 80,000 hospitalization and 1300 deaths from diarrhea each year in their countries. This example shed light on the importance of careful country-specific epidemiology which enables rational balancing between benefit and risk. ^ Dennehy PH (2000). "Transmission of rotavirus and other enteric pathogens in the home". Pediatr. Infect. Dis. J. 19 (10 Suppl): S103–5. ^ Tate JE, Burton AH, Boschi-Pinto C, Steele AD, Duque J, Parashar UD (February 2012). "2008 estimate of worldwide rotavirus-associated mortality in children younger than 5 years before the introduction of universal rotavirus vaccination programmes: a systematic review and meta-analysis". Lancet Infect Dis 12 (2): 136–141. ^ World Health Organization (November 2008). "Global networks for surveillance of rotavirus gastroenteritis, 2001-200" (PDF). Wkly. Epidemiol. Rec. 83 (47): 421–5. ^ Simpson E, Wittet S, Bonilla J, Gamazina K, Cooley L, Winkler JL (2007). "Use of formative research in developing a knowledge translation approach to rotavirus vaccine introduction in developing countries". BMC Public Health 7: 281. ^ a b Patel MM, Steele D, Gentsch JR, Wecker J, Glass RI, Parashar UD (January 2011). "Real-world impact of rotavirus vaccination". Pediatr. Infect. Dis. J. 30 (1 Suppl): S1–5. ^ a b Soares-Weiser K, Maclehose H, Bergman H, et al. (2012). Soares-Weiser, Karla, ed. "Vaccines for preventing rotavirus diarrhoea: vaccines in use". Cochrane Database Syst Rev 11: CD008521. ^ Taylor, Phil (14 Oct 2014). "Sanofi unit takes low-cost rotavirus vaccine into phase III". http://www.pmlive.com/. Retrieved 17 Oct 2014. ^ a b O'Ryan M (2007). "Rotarix (RIX4414): an oral human rotavirus vaccine". Expert Rev Vaccines 6 (1): 11–9. ^ "RotaTeq Is Approved In Canada" (Press release). Merck Frosst Canada. 2006-08-23. Retrieved 2008-02-29. ^ McCarthy M (2003). "Project seeks to "fast track" rotavirus vaccine". Lancet 361 (9357): 582. ^ a b U.S. Food and Drug Administration. "Update on Recommendations for the Use of Rotavirus Vaccines". Retrieved 13 July 2012. ^ Kang G, et al. Rotavirus vaccines. Indian J of Med Microbiol 2006;24:4:252-7. ^ Rheingans RD, Antil L, Dreibelbis R, Podewils LJ, Bresee JS, Parashar UD (2009). "Economic costs of rotavirus gastroenteritis and cost-effectiveness of vaccination in developing countries". J Infect Dis 200 (Suppl 1): S16–27. ^ Berkley, Seth (12 April 2013). "Beating the Child Killers". Project Syndicate. Retrieved 17 April 2013. ^ Madsen, Lizell B; Marte Ustrup, Thea K Fischer, C Bygbjerg & Flemming Konradsen (18 January 2012). "Reduced price on rotavirus vaccines: enough to facilitate access where most needed?". Bulletin of the World Health Organization 90: 554–556. ^ World Health Organization (December 2009). "Rotavirus vaccines: an update" (PDF). Wkly. Epidemiol. Rec. 51-52 (84): 533–540. ^ Ward RL, Clark HF, Offit PA (September 2010). "Influence of potential protective mechanisms on the development of live rotavirus vaccines". The Journal of Infectious Diseases 202 (Suppl): S72–9. ^ World Health Organization. "Global Immunization Data, March 2012". Retrieved 3 May 2012. ^ Widdowson MA, Steele D, Vojdani J, Wecker J, Parashar U (November 2009). "Global rotavirus surveillance: determining the need and measuring the impact of rotavirus vaccines". The Journal of Infectious Diseases 200 (Suppl 1): S1–8. ^ Giaquinto C, Dominiak-Felden G, Van Damme P, Myint TT, Maldonado YA, Spoulou V, Mast TC, Staat MA (July 2011). "Summary of effectiveness and impact of rotavirus vaccination with the oral pentavalent rotavirus vaccine: a systematic review of the experience in industrialized countries". Human Vaccines 7 (7): 734–48. ^ Richardson V, Hernandez-Pichardo J, Quintanar-Solares M, et al. (January 2010). "Effect of rotavirus vaccination on death from childhood diarrhea in Mexico". N. Engl. J. Med. 362 (4): 299–305. ^ Patel M, Pedreira C, De Oliveira LH, et al. (June 2009). "Association between pentavalent rotavirus vaccine and severe rotavirus diarrhea among children in Nicaragua". JAMA 301 (21): 2243–51. ^ Matson DO (2006). "The pentavalent rotavirus vaccine, RotaTeq". Seminars in paediatric infectious diseases 17 (4): 195–9. ^ Bines J (2006). "Intussusception and rotavirus vaccines". Vaccine 24 (18): 3772–6. National Clearinghouse Guideline: Prevention of rotavirus gastroenteritis among infants and children. Recommendations of the Advisory Committee on Immunization Practices (ACIP).